It's that time again for another Goosey Review & Giveaway. I'm excited to announce that I will continue as one of Gooseberry Patches Early Bird Reviewers for 2013! The Gooseberry Patch Cookbook series truly is one of my favorite cookbook series. 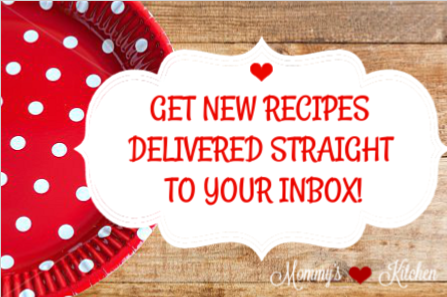 All of their recipes are tried and true from real home cooks like you and me. My first review book for 2013 was a much needed one. Gooseberry Patches Slow Cooking All Year Round. The title says it all. I own 4 slow cookers in various sizes, and I can honestly say I use each and every one of them. I do find myself using my slow cooker more in the winter and summer months. I need to start using it all the time, because it really does makes my life easier. My slow cooker gets a huge workout in the summer, because I can still enjoy all my favorite comfort foods without heating up the entire house. 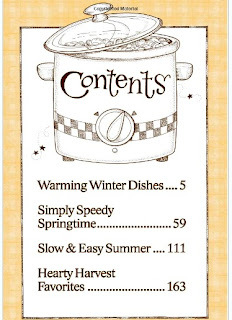 In the winter it runs non stop with soup, stews and chowders. This year I have vowed to use my crock pots year round. So, when I say this cookbook came at a perfect time you can see why. 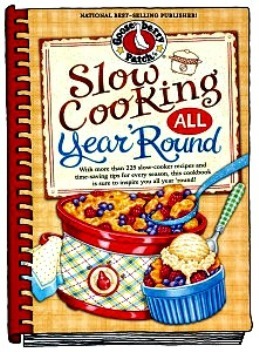 This yummy cookbook is broken down into seasons, so if you're a seasonal cook your going to ♥ this. Slow Cooking All Year Round is packed with over 225 no fuss recipes specially tailored for your slow cooker. A few Winter Favorites are Moms Holiday Ham, Hot Lemonade, Four Cheese Lasagna, Winter Night Chowder and a Ooey-Gooey Chocolate Cake. The Springtime chapter features St. Patricks Day & Easter Recipes. Scalloped Potatoes and Ham, Reuben Bake, Slow Cooker Iris Stew and more. Slow and Easy Summers has barbecue favorites like Chuck Wagon Beans and BBQ Beef Sandwiches. I don't want to forget all the summer cobblers, Berry Cobbler, Peach Cobbler and even a Breakfast Cobbler. Last but not least is a sampling from Hearty Harvest Favorites. They have a Hot Turkey & Stuffing Sandwich I can't wait to try. As well as Caramel Apple Cider, Slow Cooker Spanish Rice and a Slow Cooker Turkey Breast recipe. The first recipe that I chose to make was out of Warming Winter Dishes. I needed a quick meal and Grammam Phyllis's Italian Meatballs did not disappoint. This recipe is a basic meatball recipe that utilizes store bought spaghetti sauce. I have never made meatballs in a crock pot, so this was a first for me. Carson is my big meatball lover, so he approved this recipe with a thumbs up. Crock Pot Hot Chocolate was the next recipe on the list. Our weather lately has been crazy to say the least. One day it's warm and the next we get snow. All I can say is that's how we roll in Texas. Last weeks we were blessed with several inches of rain, so it was really cold and yucky outside. While the kids were at school I prepared this rich and yummy hot chocolate. It was a nice surprise and after school snack. It only took 2 hours to cook and then I just kept it on the warm setting. While I was thumbing through the cookbook I got a nice surprise. 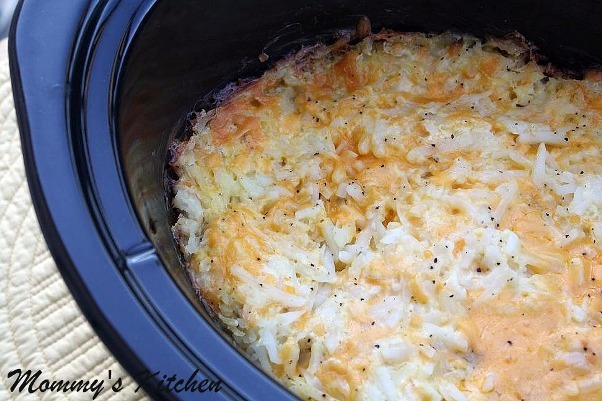 My recipe for Slow Cooker Cheesy Hash Brown Casserole was among one of the recipes. It was such a unexpected treat. This Hash Brown Casserole graces my dinner menu quite often. Originally this was a oven recipe, but I converted to a slow cooker recipe as a time and space saver during the holidays. Since cooking this in the Slow Cooker I haven't prepared it any other way. This dish pairs perfectly with ham, pork chops or smoked sausage. 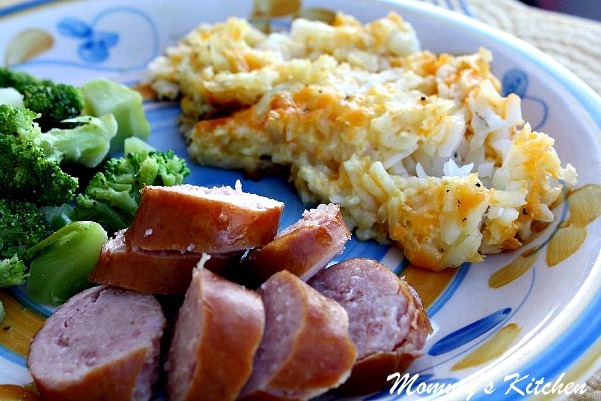 It's also great with leftover ham added to make a cheesy hash brown casserole with ham. Review Recipes are listed at the end of this post. This new cookbook is a great addition to my gooseberry collection. Since doing this review I have already made four recipes with a few others waiting on my list. 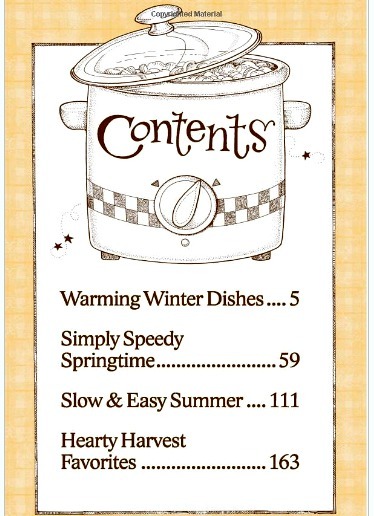 Would you like to get your hands on a free copy of Slow Cooking All Year Round? Well you can, because the wonderful folks at Gooseberry Patch have hooked me up with an additional copy to share with one of my readers! This giveaway is now closed. The winner is Jen Gerwig-Dively. Leave a comment on this post telling me what you're favorite crock pot meal is? For me it's a roast every time. You can do any or all of the following to earn extra entries. Please leave a separate comment for each one. 1. Become a Fan of Gooseberry Patch on Face book. When you have done that, return to this post and leave a separate comment letting me know. 2. Join Gooseberry Patch "Circle of Friends" so you can stay Gooseberry Patch updated. 4. Mention this giveaway on your face book page. Come back and leave a comment telling me so. If you can't wait I wanted to let everyone know that Barnes and Nobles has it priced at $10.45 and you can also grab one from Amazon.com for $11.20. Both are awesome prices. Disclosure: Contest open to U.S & Canadian Residents only due to shipping charges. If you leave an anonymous comment please include your email address. This way I can contact you in the event that you're a winner. Winner will have 48 hours to reply or a new winner will be chosen. 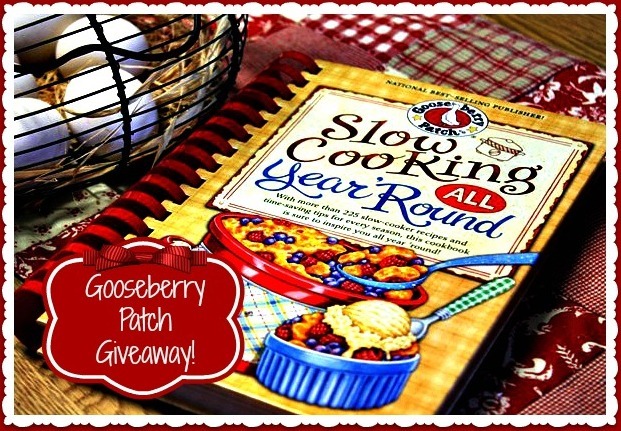 I would like to thank Gooseberry Patch for sponsoring this review and providing an additional copy of "Slow Cooking All Year Round" to use in a reader giveaway. In a large bowl combine beef, bread crumbs, cheese and eggs; mix well. Form beef mixture into one inch meatballs. Place meatballs into slow cooker and cook on high for one hour. Drain any grease. Add the spaghetti sauce and cook on low for 4 - 5 hours. About 15 minutes before serving prepare spaghetti noodles according to package directions. ladle sauce and meatballs over cooked spaghetti. Yields 6-8 servings. In a large bowl add the hash browns thawed or frozen, sour cream, soup, onion, shredded cheese and melted butter. Mix to combine. Spoon hash brown mixture in a 4 quart slow cooker that has been sprayed with non stick spray. Sprinkle salt and pepper on top cover, and cook on low for 4-5 hours or until done. The casserole should be crispy on the sides and bubbly throughout. Yields 8 Servings. I love slow cooker meatballs! I make them all the time. Don't use it nearly enough, but Wassail during the holidays stays in my crock pot! Love your site:) And will tweet about it, since I am not on Facebook. I love making soup in the crock pot. It is so easy to just throw all the ingredients in and let it cook all day. It's so hard to narrow down a favorite, but I'll say a roast. Pot roast, only way I will make it. But sweet and sour meatballs are always a hit for parties too. I'm a Facebook fan of Mommy's Kitchen. I am also a Facebook fan of Mommy's Kitchen. I like Gooseberry Patch on Facebook! Just liked Gooseberry Patch on Facebook as well. 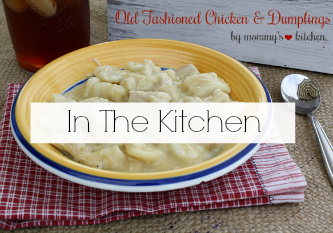 My favorite crock pot recipes are chicken recipes...chicken & rice, Southern Plate's cheesy chicken & rice, chicken & dumplings! 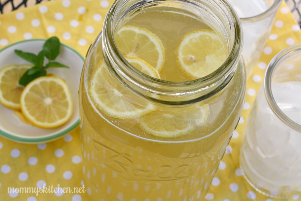 I like Mommy's Kitchen on Facebook! Heather says: i love chicken and vegis i need to try more things but i am pretty new at the slow cooker. My favorite crockpot meal is pulled chicken. Boneless, skinless breasts and a bottle of bbq sauce, and dinner is done. Became a fan of Gooseberry Patch on Facebook. Became a fan of Mommy's Kitchen on Facebook. Joined GP's "Circle of Friends". Posted a giveaway link on my FB page. My favorite slow cooker recipe has to be split pea soup. We usually get a HoneyBaked ham for Christmas, and I look forward to using the left bone/meat for split pea soup! I like shredded barbecue beef in the crockpot. I love my slow cooker and use it all the time, I have 2 slow cookers but I want to get a bigger one. I would have to say my favorite meal is the same as yours Roast Beef...it is so good! I have been a fan of Mommy's Kitchen on FB. I am a fan of Gooseberry Patch on FB. I joined Gooseberry Patch's Circle of Friends. I do caramelized Vidalia onions in the slow cooker every fall. Just thin slices of about 6 Vidalia onions wtih beef broth, garlic, and butter. Makes your home smell amazing and can be used in soups, casseroles, on sandwiches, anything. So many to choose from...but one of my favorites is taco stew! I am a fan of Mommy's kitchen on facebook. I love beef roast with carrots and potatoes. I am follower of Gooseberry Patch on FB. I am a Gooseberry Patch Circle of Friends. Gooseberry Patch and my crockpot ♥ my two favorite things! Liked Gooseberry Patch on FB!! Already liked you on FB!!! Gave you a shout out on FB! I love to make Black Bean and Chicken Salsa in my crockpot! I love to make Pulled Pork in my crockpot. I love barbequed baby back ribs in my slow cooker! I am a fan of Gooseberry Patch on Facebook. My favorite easy crockpot meal is cranberry bbq chicken- just a can of cranberry sauce, a cup of bbq sauce, and a few chicken breasts. I like to make Chili Cheese dip or Hot Sausage dip in my crockpot! My favorite Crockpot recipe is the No Peek Beef Tips from Mommy's Kitchen, I do them in the crockpot many times while I work so that we have a great meal to come home to! 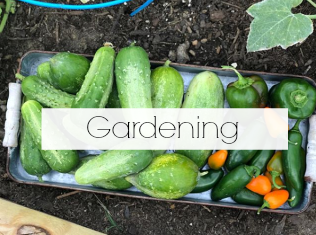 Liked Gooseberry Patch on Facebook. 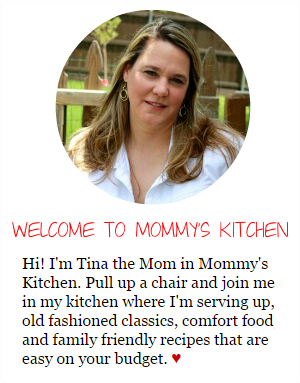 Liked Mommy's Kitchen on Facebook! I love using my crockpot. My favorite crockpot recipe is Bourbon Mango Pulled pork - it's yummy and makes great pulled pork sandwiches! Favorite Crockpot Meal is Chicken Tortilla Soup. I have two favorite crockpot meals. #1. Beef Roast with carrots and potatoes #2. Crockpot Lasagna. Not having a stove (just recently bought the house and have to remodel the kitchen) I am relying heavily on my crockpot!!! Just wish I had more recipes! Already a FB fan of Mommy's Kitchen. I'm a FB fan of Gooseberry Patch. Joined Gooseberry Patch's "Circle of Friends." What's my favorite crock pot meal? That's a hard one, as I have many favorites, I would have to say roast. Thanks for this giveaway. I would never have thought of making meatballs in the crockpot! I use it for so many other things that it makes perfect sense. My favorite would have to be shredded beef sandwiches. I am a Facebook Fan of Mommy's Kitchen. Quite a great selections of yummy recipes. One of my favorite slow cooker recipes is Hamhocks and Pinto Beans. Italian Beef is my favorite thing to make in my Crock Pot. I use mine year round, LOVE it! I just joined Gooseberry Patch "Circle of Friends", I didn't know about this, thanks for passing this information along! 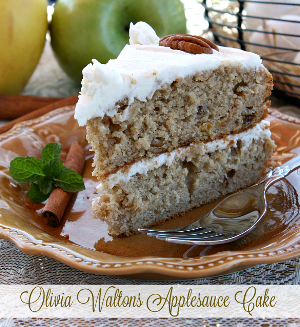 And last but certainly not least, I just became a fan of Mommy's Kitchen on facebook! Oooh, I just love Gooseberry Patch! Thank you for sharing the recipes...I've been wanting to try both a crockpot hot chocolate and hashbrown recipe and here I find one for each! :D Yeah! I follow Gooseberry Patch on FB. I'm part of Gooseberry Patch Circle of Friends group. I'm a fan of Mommy's Kitchen on FB. Shared about your giveaway on FB. I'm a follower of Gooseberry Patch on FB and you on FB. One of my favorite crockpot recipes is pulled pork! I'm a fan of Gooseberry Patch on FB! 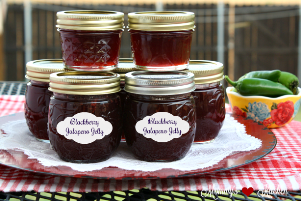 I love Gooseberry Patch and your blog, too. I have never won anything so who knows, maybe this will be my first time! Became a fan of "Mommy's Kitchen" on FB! My all-time favorite slow cooker meal is Cajun style red beans and sausage! Became a fan of Gooseberry Patch on Facebook! I joined the Circle of Friends! I became a fan of Mommy's Kitchen on Facebook! I just posted about the giveaway on my Facebook wall! My favorite crock pot meal is French Dip sandwiches! They are a hit with the whole family and super easy to throw together! pot roast with potatoes, carrots and onions!! and creamed corn!!! I'm a fan if Mommys Kitchen on Facebook! I am a subscriber to Circle of Friends! My favorite crockpot meal is a pot roast! Pulled Pork is my favorite!! 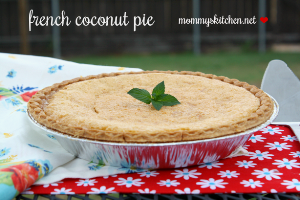 I am already a fan of Mommy's Kitchen on Facebook! I mentioned this giveaway on my Facebook page! I love the recipes and really love the menus you have on here. 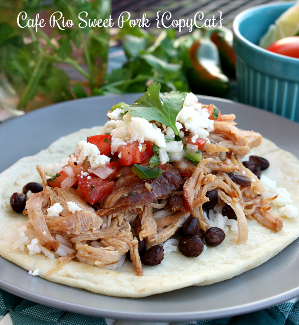 My favorite crockpot meal is shredded pork tacos! I love my slow cooker. Anytime I can use it I do. I am a Facebook fan of Mommy's Kitchen. I am a Facebook Fan of Gooseberry Patch. My favorite crock pot meal is pulled pork, using either root beer or Dr Pepper. Thanks for the chance to win the giveaway. My favorite slow cooker recipe is potato & ham cheese soup. I just joined Gooseberry Patch "Circle of Friends"
I love my crock pot, I make meatballs, italian sausagae is sauce, beef stew, polish sausage soup and chilli. 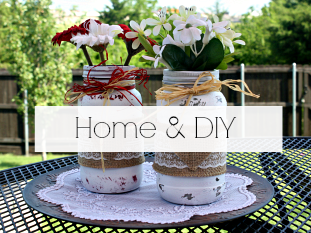 I am always looking for more ideas !! Mine is for chicken...love how tender the meat is! I have several chicken recipes that are my favorite. One of my favorite crock pot dishes has to be beans and ham hock, yummy! I also really like baked apples too, it makes the house smell sooo good while it cooks all day. My favorite crockpot recipe is for "refried" beans. 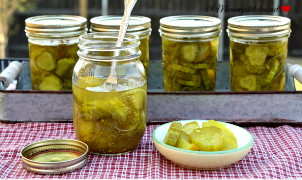 They are so much better than canned beans, and I can make a huge batch. My favorite crockpot recipe is Pinto Beans and Ham, served with cornbread. I love Roast and potatoes in the crockpot! I recently made a "Lasagna Soup" recipe in my crockpot,..its kind of thick like a goulash, I really liked it - Pasta dishes are my favorite to make in the crockpot! I follow Gooseberry Patch on FB! 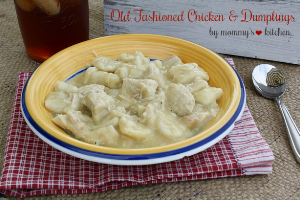 I love chicken and dumplings in the crock pot....yummmy!!! I am a fan of Mommy's Kitchen on Face book. Anything in the crock pot is my favorite that speeds up dinner . I currently have two crockpots and use them almost daily. My favorite meal is spaghetti sauce since it can cook for hours and the flavors are so much better than what I can do on the stove. I love the chicken and dumplings. So easy and delicious. I am already a fan of Gooseberry patch on FB! I am already a part of Circle of Friends!! I love a good roast with veggies. I belong to Circle of Friends. My favorite crockpot meal is pot roast! I love to make a Hawaiian chicken meal that I pre-prep and freeze. 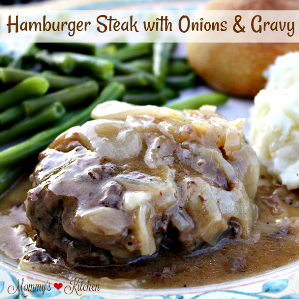 Take it out of the freezer, pop in the slow cooker and dinner is done! I love these cook books, would love to win one! Love ms a Slow Cooker . I try everything in it from main meals to desserts. I liked you on Facebook and can't see how I missed doing that before now . I have followed your Blog foe s good while. I love cooking crockpot goose breasts. I let them cook for 6-8 hours and the meat just falls apart. Then I add in bbq sauce and make delicious sandwiches! I love slow cookers!! Make the same things and would love these new recipes. My favorite thing to make in these cold, winter months is my vegetable soup, it is delicious! Antthing is good out of a crock pot!! Need to use mine more, too! I "liked" Gooseberry Patch on Facebook!! My favorite recipe is Cashew Chicken in the crockpot, it is so good this way and will only make this recipe in a crockpot. I, too, love slow cooker pot roast, but I also like pulled pork for barbecue sandwiches. Fast and easy t prepare. My all time favorite recipe came with my first Crock Pot...Scalloped potatoes with Ham. I sure could use some new recipes for the crockpot and would love to win this cookbook! I am a fan of Gooseberry Patch on Facebook.....Love Gooseberry Patch! 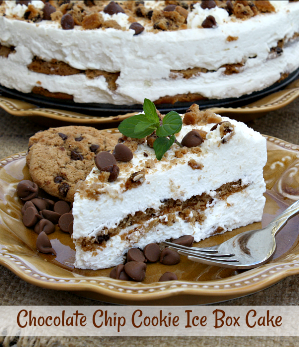 I am a fan of Mommy's Kitchen on Facebook....thanks for sharing such great recipes! I also shared the giveaway on my facebook page. I love to make Taco Dip in the crock pot. I like Gooseberry Patch on FB! I am a member of Circle OF Friends! I like Mommy's Kitchen On FB! My favorite recipe for the crockpot is roasted whole chicken, always comes out perfectly juicy and tender. My German heritage makes me cook Spare Ribs and Sauerkraut! I love to make potato soup in the crock pot! I love Chicken Tacos in my crock pot...I got it from a friend and we have used it a lot and also shared it with several who also enjoy it!! I love any kind of soup in the crockpot! I just did all 5 of the other ways to enter...Please enter me. :) Thanks soooo much!!! I love meatballs in my crockpot. Its great when having a party also. Became a fan of Mommy's Kitchen on Face book. I love Pork roast in my crock pot! My husband likes Beef roast. We had beef roast last nite! My favorite slow cooker meal is pulled pork with a vinegar mop sauce. Yum!